I was raised in a few different households. My mother was addicted to drugs and my father was running around on her. I was taken in by my father when my mom was deemed unfit to have custody of me. My stepmother was the woman my father had been seeing while he was married and saw me as a reminder of my mother, but played the part of caring mother to please my father. I was beat, harassed, and ridiculed by my stepmother for the sole reason of not being her child. To her, I was a constant reminder of a burden that she had no intention to bear. I recall her taking me with her children to church on the “important days” of Easter and Christmas. She claimed she was a believer of God. I grew up in a small town in Tennessee and went to church regularly with my parents. At the age of 11, I gave my life to Christ and my faith was always an integral part of my life. I was a unique child as at an early age I was diagnosed as being on the autism spectrum having Asperger’s. This caused me however to have a difficult time socially and was usually to myself a lot of times. I would not even spend much time with my family as I wanted to avoid such situations. I am a Christian because I didn’t choose God, rather He chose me. I was 18 years old in college. After experiencing the human condition; the lack of love, care, charity and the abundance of pain and suffering in the world and in myself. I realized that although I had a very good life, I was loved and cared for, and suffered comparatively to others very little; my own struggles always took precedence over others and realized that even when I did something good it was often with selfish reasons (It felt good or I will be liked). I looked in the mirror attached to my combination dresser/desk of my small dorm and wondered, why are we the way we are? It was then that I realized that there was something intrinsically wrong with all of us. Sometimes I think about how crazy it is that I believe in God. I mean really! Why do I believe in someone who claims to be an All-Powerful, Knowing, Loving, Creator of all, and Great in spite of all the unanswered questions in life and bad things that happen? Why do I continue to cling so tightly to a particular way of life and faith that is most of the time so hard. HAVING FAITH IN GOD IS HARD. I have thought to myself, “Man, it would probably be so much easier NOT to believe in God, not to hold on to these values that seem so difficult and impossible sometimes. Plus, some people ‘without’ God seem to be doing alright”. But that is a lie. And I honestly would never trade my faith in Jesus Christ for anything. I don’t want to live one day without trust, hope and faith in Him. My faith is my own. It is very personal to me. I believe some things others may not. I believe things in the Bible not everyone does. And I believe God is alive supernaturally in my heart, in my soul, and in life and creation itself. I departed from Christianity as an act of rebellion from the cold religion that my parents raised me in. I was blinded, most likely by my ambitions, to the rich, colorful, robust Christianity that laid in wait for me. I went to a secular State college and Jesus found me. Woke me up with reason and thoughtful reflection from the slumber my mind was in. It was by reason (and the Holy Spirit’s leading) that I became a Christian. 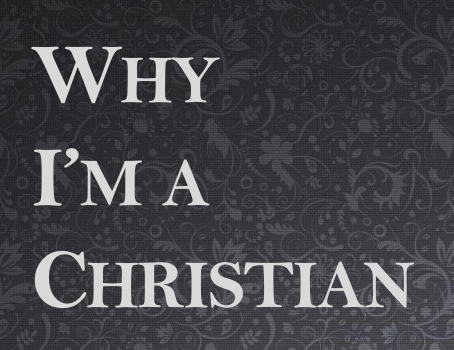 Why do I stay a Christian? One of my friends recently founded an organization that I believe is a powerful witness to the hope that we have within us for the hurting. Here’s a little bit about the organization. I hear about so many people who come from broken backgrounds. Often their spiritual journey takes them into amazing locations and their conversion to Christianity results in more than a spiritual change, it creates something like an entire lifestyle and change of worldview as well. My story does not take me to the far edge of the spiritual universe. My home was a great one. My father is the man I want to become and my mother is not only the most intelligent woman I know, but also the hardest working. Both will drop everything to help a stranger so you can imagine what they do for their kids. They are both solid Christians. From the burned Honduran girl they housed and treated to the hitchhikers who have been given a new start to the children who they have bailed out of troubled times, my parents have ALWAYS lived far below their means because of their willingness to help others. I want to be like my parents. They have influenced my Christianity more than any single person but I am not a Christian because of them.